The 17th and 18th of October combine to celebrate the greatness of the gifts that the See of Antioch, Saint Ignatius and Saint Luke, gave to the Church. Antakya is now a dusty and forgotten town in the region of Hatay near the Turkish Syrian border, but in the first century of the Incarnation it was a crossroads of the world and the third city of the Roman Empire after Rome herself and Alexandria. She was the first great city outside of Palestine to receive the Gospel and she returned much fruit: the Evangelist who gave us the most well written of the Gospels and one of the great early martyrs, who himself knew the Apostles and left us a series of letters written on his way to martyrdom in Rome that give us a vivid portrait of the life Church’s life in the generation that followed the death of that first generation who had seen the deeds and heard the words of Christ themselves. Saint Ignatius of Antioch was martyred in Rome under the Emperor Trajan likely in the first decade of the second century of the Incarnation. He is thought to have been born around the middle of the first century and ancient tradition tells us that he was brought from Antioch to Rome on the orders of the Emperor Trajan himself to be martyred in the Colosseum sometime in the first years of the second century. His seven letters written to the churches of Ephesus, of Magnesia, of Tralles, of Rome, of Philadelphia, of Smyrna, and to his friend Polycarp give a great understanding of the life of the Church during those years immediately following the end of the apostolic age. In his letter to the Church of Smyrna chapter 8 Ignatius gives us the first written record of the phrase “Catholic Church,” saying “wherever the Catholic Church is there is Jesus Christ.” He echoes here both the words of Jesus Christ in Mt. 18:20 that he undoubtedly heard from the apostles and St. Paul’s theology of the Church as Mystical Body of Christ. And the familiarity with which he uses the words “Catholic Church” indicates that his audience already at the beginning of the second century was quite familiar with the concept. In this chapter he also gives voice for the first time in the written record of the idea of a Catholic living in a particular diocese being loyal to the bishop of that diocese thus providing concrete early support for a concept that has governed the life of the Church ever since. In chapter 7 of that same letter to the Smyrnaeans Ignatius calls the Eucharist the “flesh of our Savior Jesus Christ.” This is the same theme as that which had only been written down a few years before in Saint John’s Gospel, chapter 6 by our modern rendering. And it is also unsurprising since both Ignatius and his friend Polycarp were reputed in later generations to have been hearers of the Apostle John. So yes the idea of the Real Presence of the Body, Blood, Soul, and Divinity of Jesus Christ in the Blessed Sacrament also goes back to the beginning. It really is remarkable to read Saint Ignatius’ collection of letters to see how many of the beliefs that are central to the life of the Church today were equally central in the generation that followed the apostles. The collection can be found here. What can we say about Saint Luke? He is universally regarded by the ancient sources of the third Gospel which bears his name; he is additionally the author of the Acts of the Apostles, the only volume that gives us a history of the early Church from the Ascension of our Lord stretching to the years just before the martyrdom of Saints Peter and Paul in Rome; and he is mentioned in several of Saint Paul’s epistles. Saint Luke begins his Gospel with the acknowledgement that others had written accounts of the life and doings of our Lord before him, but that he felt the need to go over all of the facts from the beginning and render his own to the mysterious figure Theophilus. He speaks of hearing the story of Jesus Christ from “eyewitnesses and ministers of the word” who had preceded him. The first of these must have been Saint Paul. He acknowledges himself as a frequent companion to Saint Paul in the Acts of the Apostles, including in the famous ‘we’ sections which are the only first person narrative accounts in all of Sacred Scripture including the journey of Paul from Jerusalem to Rome, the place of his eventual martyrdom. Saint Paul offers vary little biographical information concerning our Lord in his epistles but if you ever wonder what the story he told to his hearers about the life of Christ was it would be wise to consult Saint Luke’s Gospel. But there were other eyewitnesses too. Saint Luke was not of Jewish origin, but born a pagan: the ancient sources are virtually unanimous that he was born a pagan in the city of Antioch. In fact his Gospel and the Acts of the Apostles are the only books of Sacred Scripture written by someone who was not a blood descendant of Abraham. And it also seems that he spoke with the Mother of God herself, the Blessed Virgin Mary. He is the only Evangelist who gives us an account of the Annunciation, of the birth of John the Baptist, of the shepherds in the field at Bethlehem, and of the old priest Simeon and his prophecy to the Immaculate Virgin Mother of God at the presentation of our Lord in the Temple. He gives us the great hymns of the Magnificat, the Benedictus (the Canticle of Zechariah), and the Nunc Dimmitis the canticle of old Simeon when he laid eyes on our Lord. All of these hymns are still used in the Divine Office of the Western Church more than nineteen centuries after Saint Luke’s Gospel was written. And I would like to stress once more Saint Luke’s relationship with Saint Paul. It has been said by more than a few scholars that all of Christian theology since has merely been a footnote to Saint Paul. There is much to recommend this point of view. And if you want to understand the story that was the source for Paul’s dazzling theology it would be wise to meditate on the Gospel that the great saint and Evangelist of the now decrepit See of Antioch once gave us, and to meditate on the relationship between the concepts illustrated in Paul’s epistles and the stories told in the Gospel of Saint Luke. And pray for the resurrection of Antioch. On this feast of Saints Peter and Paul the Shura council of the Islamic State of Iraq and the Levant (الدولة الاسلامية في العراق والشام ) has now, officially at least, transformed the Islamic state into a caliphate, with its leader Abu Bakr al-Baghdadi as caliph (الخليفة) of all Muslims and its borders stretching from Aleppo to Diyala province of Iraq. Caliph is the ancient Islamic term for a position that by the Catholic mind may well considered a combination of Pope and Emperor. The first four caliphs conquered much of what is now the Islamic world in a series of lightning campaigns that greatly weakened what was left of the Catholic Roman Empire in the east and destroyed the Sassanian Persian Empire during the half century after Muhammad’s death. After that the position, while remaining powerful, diminished in the eyes of the Muslims as it was occupied by a series of corrupt rulers with the title then being tossed around after the destruction of the Abbasid Empire to whomever was the strongest Muslim ruler of the day before finally landing in the lap of the Ottoman Sultans. They held it for nigh on half a millennium after they conquered Constantinople and the position was finally eliminated by Mustafa Kemal, the founder of the modern Turkish Republic, in 1924. The importance of this moment will of course only be known in the future. The Iraqi government is already launching an offensive against the gains made by the Caliphate in northern Iraq but it has brought what can at best be described as mixed results. This may be a very significant moment or it may be a flash in the pan, but these fighters are determined, cunning, bold, and brutal and that should never be underestimated. Today is the celebration in the Latin Rite of the Catholic Church of the Solemnity of the Feast of the Nativity of the Lord: Merry Christmas! Today the Creator of all things comes as a frail and helpless little child to live among us. The turn of the age was when Mary, the Mother of God, said yes to God through the Angel Gabriel at the Annunciation and today that change is manifested in the form of an infant lying in swaddling clothes in a manger in a cave on a hillside. There is much to this. The Church of the Nativity in Bethlehem. 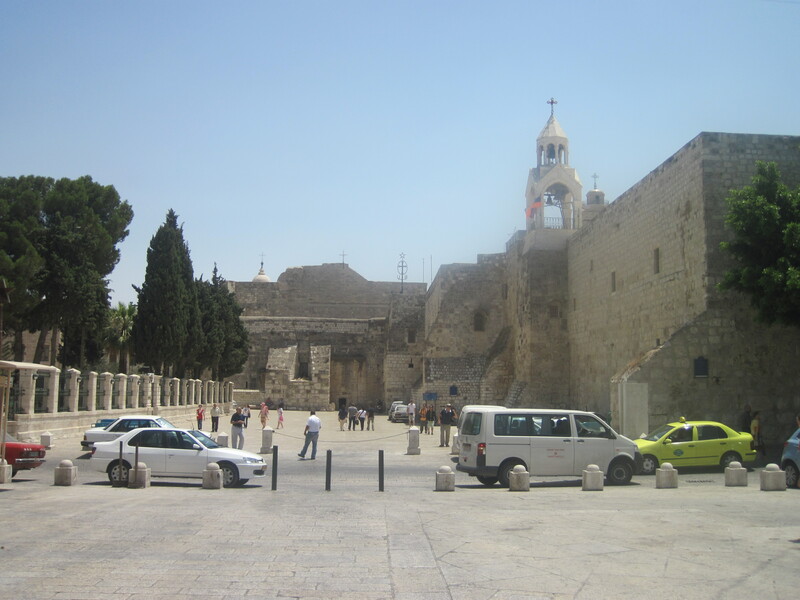 The wire star above and to the right of the doorway marks the spot under which Jesus Christ was born (Taken by me August 3, 2011). December 12 is the Feast Day in the dioceses of the Americas of Our Lady of Guadalupe. The apparition of the Blessed Virgin Mary to the peasant boy Juan Diego in 1531 changed the course of history. This was a signal moment of grace for the world and for the Western Hemisphere. In the decades after the apparition of the Blessed Mother the pagan gods native to this continent were banished to the darkness from which they came, and the Church was triumphant from the Rio Grande to the Tierra del Fuego. The increasing secularization of the Americas in our own time should not blind us to what an achievement this was half a millennium ago. And it should also remind us that mass conversions are a historical fact and they are just as possible in our own time as they were in the 16th century or in the 4th century. The whole of the Mediterranean basin was converted by the power of the Holy Spirit working through the early Church in the days of Rome. The barbarian tribes who overwhelmed the Western portion of the Empire in the succeeding centuries were then also converted by the same Spirit and the same Church. As were the Americas following the intervention of Our Lady of Guadalupe. And yes, there was the mass apostasy of the eastern and southern shores of the Mediterranean to Islam, but that need not be permanent. If there have been mass conversions in the past then it is reasonable to believe, despite the darkening skies of our own day and time, that there will be mass conversions in the future. And mass conversions begin first and foremost with prayer. Pray the Joyful Mysteries of the Rosary on Monday for the See of Constantinople, the Sorrowful Mysteries on Tuesday for the See of Antioch, the Glorious Mysteries on Wednesday for the See of Jerusalem, the Luminous Mysteries on Thursday for the See of Alexandria, and the Sorrowful Mysteries on Friday for the See of Carthage: for their liberty and their salvation and the restoration of their ancient position as pillars of the one, holy, catholic, and apostolic Church in communion with the See of Peter in Rome; for the conversion of the Jewish people and the conversion of the Muslim peoples. Our Lady of Guadalupe pray for us!